We've been enjoying our 3-day weekend by being lazy and relaxing! I really don't want to go back to work tomorrow - but gotta pay those bills, right? We'll be heading over to my parent's house today for some eats and apparently a Mario Party party - my sisters are addicted (and maybe we can be entertained by watching my mother try to play too, hehe!). Anyway, I made this dinner a couple weeks ago after our CSA included these amazing peas. They're just beautiful, aren't they? Enjoy your Monday guys! Place spinach in a microwave-safe bowl and add about a tablespoon or two of water. Place in microwave for about 2-3 minutes, or until wilted. Let cool slightly. Stir in sour cream, parmesan cheese, and about half of the minced garlic. Lay the chicken breasts flat and spoon about half of the spinach mixture on top of each. Either roll the chicken breasts or just fold up and tie with kitchen string to seal. Place chicken breasts in a greased baking dish (seam side-down) and top with additional Parmesan cheese, if desired. Bake for about 35 minutes, or until chicken is white throughout and Parmesan on top is golden brown. Meanwhile, heat a large skillet under medium high heat and melt butter. Add remaining minced garlic and thai chiles and saute for about a minute or so. Add mushrooms and cook for about 10-15 minutes, or until mushrooms start to "sweat". Add in peas and cook an additional 5 minutes. Season with salt and pepper to taste. Serve chicken breasts atop a big heaping of the mushroom and pea mixture. This was definitely one of those weeknight meals that you say "wow" to. 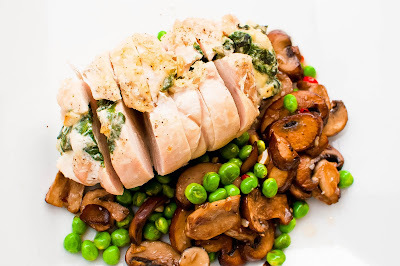 The chicken was juicy and the mushroom & pea mixture complimented it perfectly with just the right amount of spicy kick! If you're struggling to find a good weeknight meal that fresh, seasonal, and tasty - look no further! They really are beautiful! I love this time of year, when fresh produce is so bountiful. I haven't been part of a CSA in a few years...I really miss it. It felt like Christmas every week when I got my box! Great combo and looks fantastic! I ma so impressed with this recipe because I love spinach and love stuffing chicken with it; no better combination; saving this one. Beautiful! I love your stuffing choice for the chicken! Such a tasty looking dish! It sure win a WOW from me. It's simple, healthy and it looks fabulous! This is quite a feast...hope you love your three day! What a delicious way to celebrate the 4th of Jul! I'm onboard! I'm not even a big fan of peas, but I'd be down for those! This looks like one tasty recipe. Looks like a beautiful meal. Going to have to skip the spicy veggie because of kids but they'll definitely love the parmeasean encrusted chicken! Its not only beautiful but looks so inviting. Such a good idea to stuff a chicken breast and it makes a great presentation. How did the Mario party go? Those peas are super pretty and you made a fabulous meal out of them! Hope your Mario Party party was fun! I love that game. 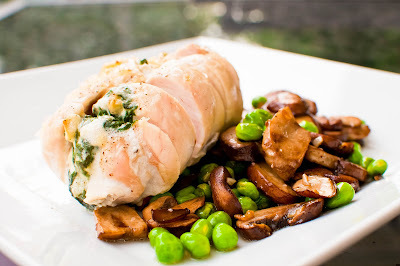 This is such an amazing dish..I love stuffed chicken and you did fantastic job! Great presentation and photos too! Such vibrant looking peas! I love how fresh and delicious this looks. A lip-smacking and healthy dish! Loved the variety of ingredients in it. Well done!! Hope you had a wonderful 4th of July. Food looks good. There's no party like a Mario Party :D And those peas and mushrooms look taaaasty. chicken becomes more healthy with spinach. that spicy peas make awesome combo. Hope you had a wonderful 4th of July. This looks FANTASTIC!!!!!!!! I love adding spinach into my meals such a good way to get flavor and your man to eat some veggies! I LOVE LOVE LOVE the name of your blog! SO hilarious! We saw you on food gawker and just started following you! Cannot wait for more fun recipes! This sounds like it's going to be pretty tasty but then you see what it looks like! Win win. 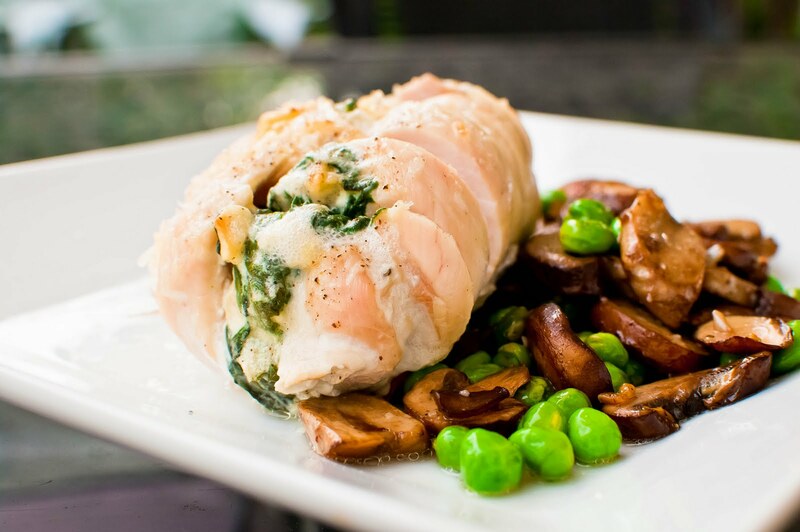 What a pretty chicken roulade...and the spinach stuffing sounds delicious. This looks seriously good and like a fairly easy mid-week meal. Might have to make it soon! It looks tasty, and the photos look so good!!! We loved stuffed chicken here! And I love me some peas and he loves some mushrooms. This sounds like a meal made for us! Your site is wonderful. I’m so satisfied to have discovered you.I appreciate to this one. Awww, this really looks good. Thanks for the recipe. I was browsing for good and easy chicken breast recipes and this one is the best. Thanks!